The celebration will launch at 18:42 (6:42 p.m. EDT), referencing the University’s founding year, on April 23 and end at 11:59 p.m. April 24. The 29-hour live broadcast from LaFortune Student Center will feature inspiring and entertaining Notre Dame stories from around the world through interviews, performances and appearances by celebrity guests. It also provides members of the Notre Dame family the opportunity to give back to areas of the University through an online fundraising competition. Notre Dame Day will feature interviews and performances with students, faculty, administrators, staff, alumni and others who are living out the mission of Notre Dame. The broadcast team will be led by alumna and Board of Trustees member Anne Thompson from NBC News; three Super Bowl champions – Joe Theismann, Steve Beuerlein and Ryan Harris; alumna and WGN Radio reporter Anne Maxfield; and a number of other reporters from the South Bend area and beyond. Highlights of the more than 200 live interviews and 27 performances include a conversation with alumnus and U.S. Sen. Joe Donnelly; a performance by two members of the Chicago cast of Hamilton, Ari Afsar and Joseph Morales, and an interview with the show’s associate director and alumnus Patrick Vassel; an interview with alumna J.J. Philbin, producer and writer of the Fox show New Girl; and much more. Former Notre Dame athletics standouts participating in Notre Dame Day are U.S. Olympic gold medalist rower Amanda Polk, NFL Pro Bowl pick Zack Martin from the Dallas Cowboys and Stanley Cup champion Bryan Rust of the Pittsburgh Penguins. During Notre Dame Day, anyone who makes a minimum $10 gift will receive five votes to cast for the more than 800 programs at Notre Dame that matter most to them. Votes will determine the percentage of the $1 Million Challenge Fund that will be distributed to each area. For more information, read the Notre Dame Day FAQ. Contact: Pablo Martinez, Notre Dame Day program director, 574-631-7106, pmartin5@nd.edu. 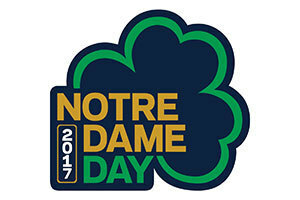 For media inquiries related to Notre Dame Day, contact Andrea Bullock, director, Annual Giving and Strategic Marketing, 574-631-1056, abullock@nd.edu.